With many visual novels out there in production mostly for handheld consoles and Sony, it gets harder to distinguish them from one another. Nothing, however, beats the ideal romantic fantasy of choosing between 16 samurai bachelors while facing the ending era of the life of samurai together. In Hakuoki: Kyoto Winds you follow Chizuru, a female protagonist in search of her missing father, who gets wrapped up in the dealings of Shinsengumi warriors who defend the old shogunate. This visual novel is heartbreaking, tender and entirely meant for those hopeless romantics or trophy hunters who want to get easy trophies for their collection. Handsome bachelors – Characters are plentiful and handsomely illustrated, moving from the standard six romance options from the PS3 and 3DS editions to an impressive increase with 16 available options. As good looks are paired up with unique and individual characteristics, not one character ever truly feels like a walking reflection of another. This makes the first play-through rather daunting when trying to decide who would be your first preferred choice, but that just adds onto the overwhelming amount of replay value. Story and Choices – The story takes place in the 15th century as players live the life of Chizuru, a modest and sweet young girl who pursues her quest in finding her father in Kyoto, Japan. The plot progresses into a more simplistic and personal story for Chizuru until more characters are included and, depending on who the love choice is, adds more intimate details about these specific male characters. This only entices for more play-throughs to distinguish the possible unique interactions and depth of each available choice. For the purpose of multiple play-throughs, without succumbing to rereading of the same story dialog, Kyoto Winds features a fast forward, rewind, quick-save ability and standard save functions, solidifying the need and ease in picking all the different options to see the turning point of each one. Again, this adds immense replay value but not at the cost of players’ sanity of repeating dialogue over and over. Pretty and polished – The game looks stunning compared to its 3DS counterpart. Menus have fresh, floral redesign that makes the game highly appealing on the superficial level. Backdrops have a higher resolution and characters’ mouths actually move in correspondence to dialog which is a small but appreciated detail. The audio is a relief as it went from peaceful ambiance to the abrupt drums of battle and conflict; for this PS Vita edition, the audio is more pleasing than the ear-cringing sounds from the 3DS version. 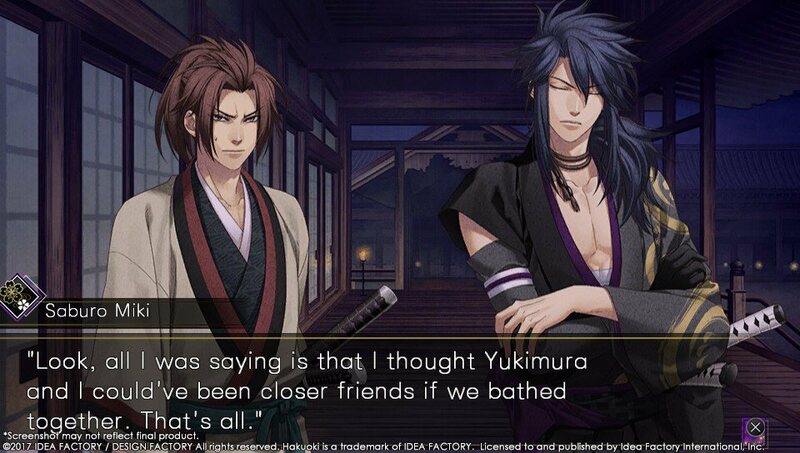 PG-13 romance pics – I’m aware that Chizuru has to first develop a strong rapport with one (or all… unfortunately not) of the Shinsengumi men before any kind of romance is initiated. Despite that, if all options for the designated character are selected, the player will receive cute, intimate screenshots but nothing intensely serious. Even something as simple as a kiss is something gamers should not really be hopeful for in this installment. Oddly enough, though, the 3DS edition had more romance progression like a first kiss and an actual continuation of the plot along with the chosen romance partner. Unlike this rendition, where the story doesn’t carry onto the next phase of the plot that the other games have, this game abruptly ends with a lackluster romance conclusion which leaves it to the player to just fantasize about what could’ve happened with the couple. Rehash – This rendition is a rehash of the previous PS3 and 3DS versions but with more suitor options and new characters that were never perceived in the previous iterations. Therefore, for those who are fans of the series, don’t expect much of a difference in the story in Kyoto Winds. The story is great, along with its characters, but unfortunately there’s nothing new or refreshing in the plot that you haven’t already seen in the other titles. Those playing it for the first time, however, will thoroughly enjoy the story and pathways that can be taken. 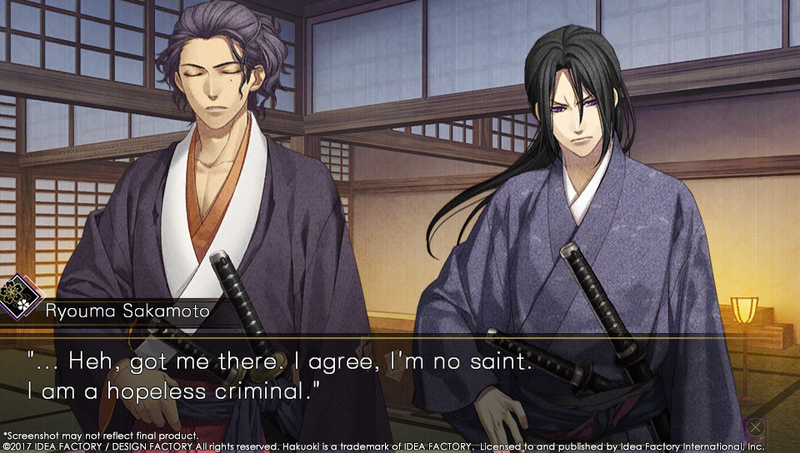 For the romantic obsessed otaku out there, Hakuoki: Kyoto Winds is a definite pick up for those days when real encounters with people just leaves you with a distasteful after-thought. It has a great story and a cast of bachelors that add spice to the drama which is what makes life interesting. Despite the additional character selection, for those who played the previous installment this may not entirely be as refreshing to the veterans as it would for the newcomers. Otherwise, enjoy a well-rounded visual novel title with this one. 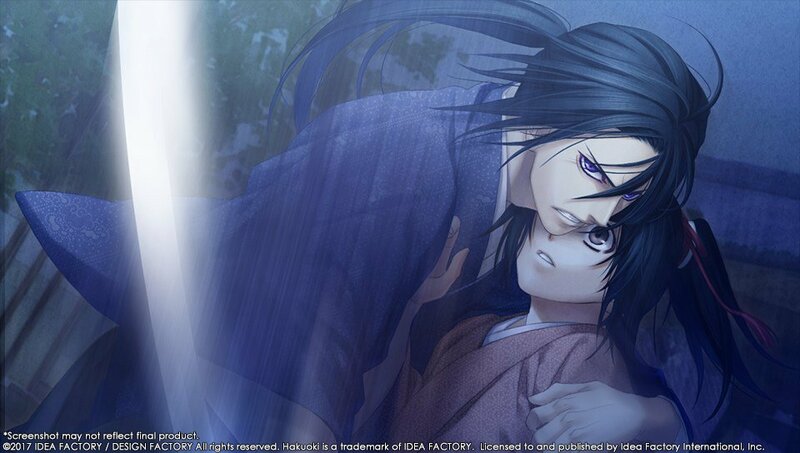 Hakuoki: Kyoto Winds was developed by Otomate and published by Idea Factory International. It was released for PlayStation 4 and PlayStation Vita [reviewed] on May 16th, 2017. A press review copy was provided for The Hidden Levels. Many studios submit copies for site review but this is in no way factored into our review scores. Games are scored on their individual merits and our rating system is explained here. PlayStation fan-girl since 1995 but an avid collector of all consoles and games. I currently reside in Silent Hill where I judge and condemn those who wander into my domain! !